Your website is picking up steam. You’re finally getting some good traffic. But how many of those visits are translating into actual business? You can use ecommerce marketing automation to enhance your online store. But it starts with collecting contact information so you can follow up with quality email marketing. 1. Add a sign-up form to your website. Use a sign-up form to collect contact information from your website visitors so you can stay in touch with them. Make your sign-up form visible on every page of your website. Whether someone visits your homepage directly or enters a separate page through search or social media, your sign-up form should be easily accessible. Constant Contact Forms for WordPress: This free WordPress plugin lets you build a professional, mobile-optimized sign-up form in minutes. Customize the form with your branding and select which fields are relevant to your business. This plugin works with all WordPress.org sites, no Constant Contact account required. 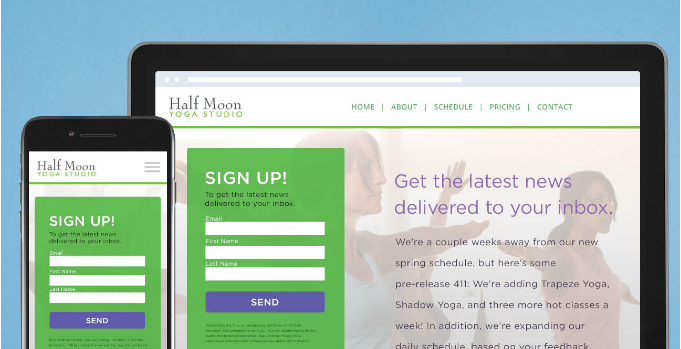 Embeddable sign-up form: Embeddable sign-up forms allow visitors to enter their contact information without ever leaving your site — resulting in 25 percent more email signups. You just need to embed the HTML form code to your site. 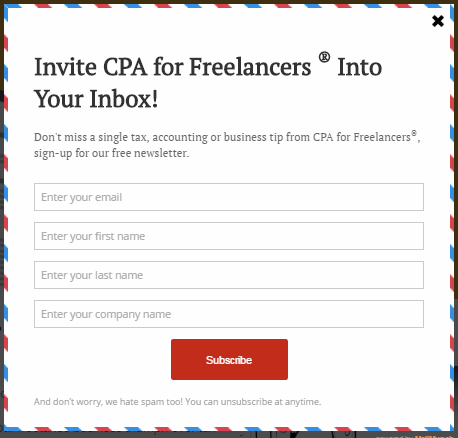 Dynamic pop-up forms: For more advanced sign-up forms, consider using a dynamic pop-up form that presents itself to site visitors after a specified period of time or when they go to leave your site. These forms have increased signups as much as 150 percent. 2. Give people a good reason to sign-up. I hate to break it to you, but “Join Our Email List” probably isn’t going to cut it. Instead, look for opportunities to highlight the benefits of joining your email list. What can people expect to receive? How often will they hear from you? What benefits are exclusive to email subscribers? Use this information to craft a 1-3 sentence elevator pitch for your email list. 3. Deliver on your promise with professional email marketing. Once someone signs up for your email list, keep the momentum going by providing an incentive to buy. An automated Welcome Email can drive action right away. 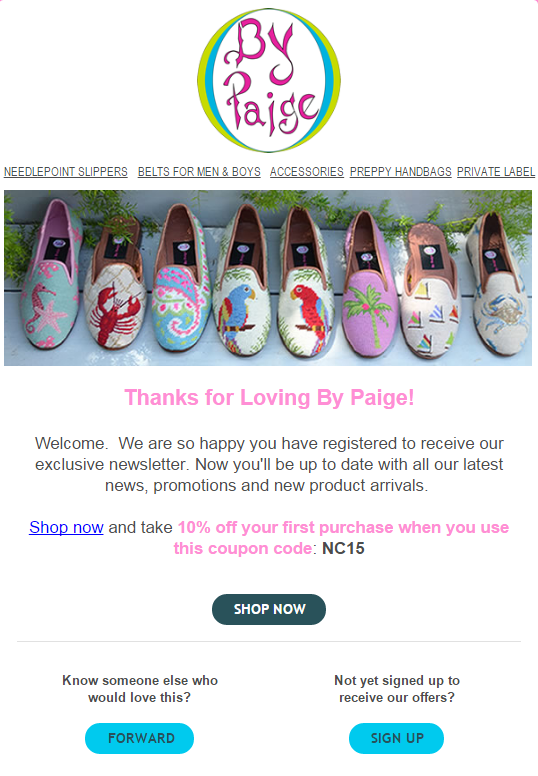 By Paige sends new subscribers a 10 percent off coupon to entice people to make an immediate purchase. Email marketing helps you reach potential customers directly and nurture them toward a sale. According to a Smith-Harmon survey, 76 percent of subscribers have made purchases from an email marketing message. Brand new to email marketing? Try Constant Contact for free! Email is also cited as the most effective digital marketing channel for customer retention. Stay fresh in your customers’ minds by sending a monthly email, reminding them of the great products or services your business has to offer. Is email marketing the missing piece in your website strategy? Put this three-step strategy into action to transform your website from a hit-and-run site to a business-generating machine. By consistently communicating with your website visitors, you’ll spend less time searching for new customers and more time nurturing people who have already shown interest in you. Get started today! Sign up for a free Constant Contact email marketing trial. Already have an account? Log in to put it to work.